Sgt. Maj. of the Army Daniel A. Dailey kicked off this year’s Battle Challenge by leading the pack of some 60 competitors on a maneuver obstacle course designed to test physical stamina and tactical skills. Now in its second year at the Association of the U.S. Army Annual Meeting and Exposition in Washington, D.C., the Battle Challenge has replaced the sergeant major of the Army’s traditional run and breakfast once hosted for soldiers and NCOs attending the meeting. 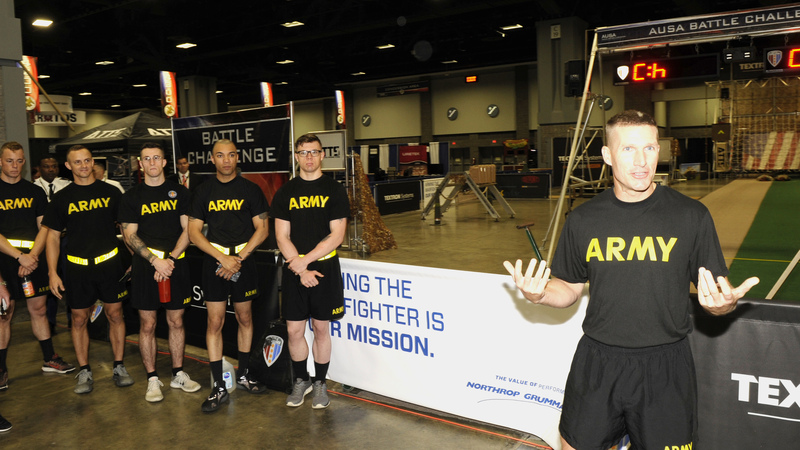 The physical challenge is a great way “to kick this off right,” Dailey said of the three-day annual AUSA meeting. “It shows our soldiers need to have the physical and technical skills to be able to fight and win,” Dailey said. The obstacle course includes a cargo net climb, knotted rope descent, wall surmount, monkey bars, a low crawl and jerry can shuttle, shooting and a litter drag with a 200-pound dummy. Competitors included the 22 soldiers and NCOs who competed in the Army Best Warrior competition, plus a group of soldiers from the Better Opportunities for Single Soldiers program. Staff Sgt. Ifegwu Ifegwu, a cavalry scout with the 10th Mountain Division’s 1st Battalion, 89th Cavalry Regiment, 2nd Brigade Combat Team, loves a good obstacle course. “Are you kidding me? This is amazing,” he said of his first run through. He planned to run it again when he saw that his time was being bested by other soldiers, and he praised the event overall for its value and relevance.